It’s no secret that people have a hard time sticking to a diet or exercise plan long-term. However, focusing on short-term goals can help people change, develop healthy habits, and improve health outcomes. And it’s been the model for our monthly Health Challenges. 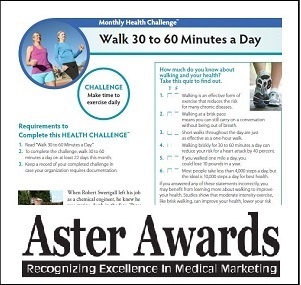 Wellsource recently received a gold-level Aster Award for its monthly Health Challenges in the Patient Education series. Out of nearly 3,000 entries from across the United States and several foreign countries, Wellsource was just one of 12 organizations to win an award in the Patient Education Series category. The Aster Awards, one of the largest international competitions of its kind, is hosted by Marketing Healthcare Today Magazine and Creative Images, Inc. This elite program recognizes outstanding healthcare professionals for excellence in their communication efforts for the calendar year 2015. Awards were issued for entries that received top marks from judges. The gold-level award for Health Challenges places Wellsource in the top 5 percent in the nation for professional excellence. Judging criteria included creativity, layout and design, functionality, message effectiveness, production quality, and overall appeal.